If you dream of escaping to the country one day and love that cosy, cottage-inspired style, you can create your own patch of rural bliss without upping sticks. Shaker doors in a gentle shade like Matt Denim will impart a touch of rustic charm to your cooking space. The Cambridge door is a pared-down Shaker door – it has the recessed central panel typical of the style, but the surrounding frame is plain, rather than made up of four parts. This gives it a contemporary twist and makes it stand out a little from the crowd. 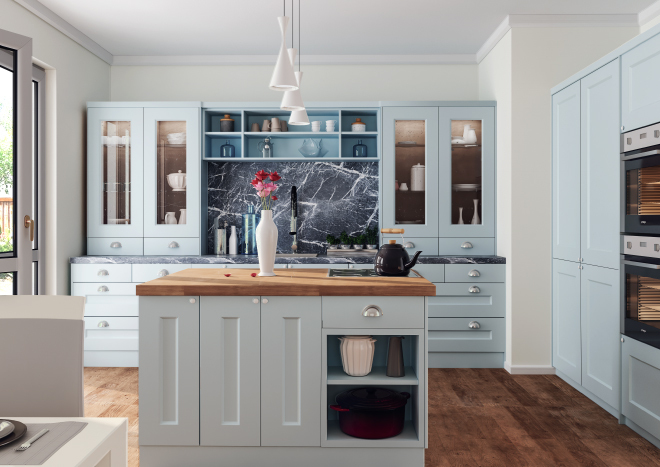 Pair your pale blue doors with warm, golden-toned woodgrain flooring and worktops to complete the countrified look. Want a low-maintenance but highly modern cooking space? You need gloss-finish surfaces and a colour that goes with everything. The Visions Ultragloss door in Ivory fits this brief perfectly – its smooth, wipe-clean surfaces mean that even the messiest cooks won’t have any trouble clearing up, and Ivory is a shade that adds light and opens up the room without looking too cold or stark. 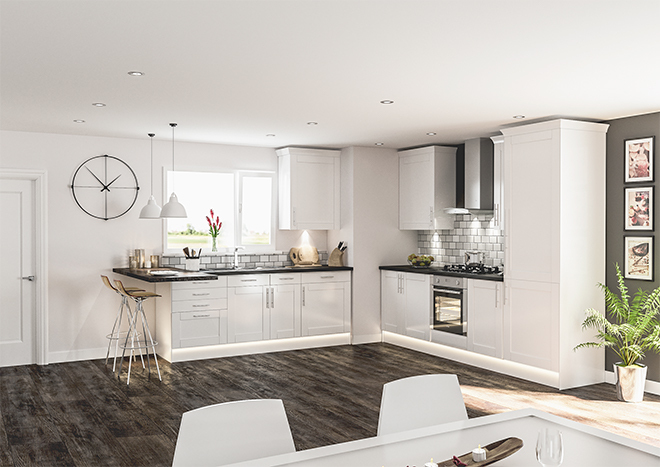 Dark granite worktops and grey floor tiles will provide a chic contrast, and you can emphasise the contemporary styling of the Visions door by choosing sleek and understated handles, light fittings and kitchen accessories. The secret to impeccable interiors is often finding the perfect balance between timeless style and functional design – and this is where the Shaker kitchen door comes in. Our Washington door is a fantastic example of the style – with its four-part frame and recessed central panel, it has a handcrafted look. 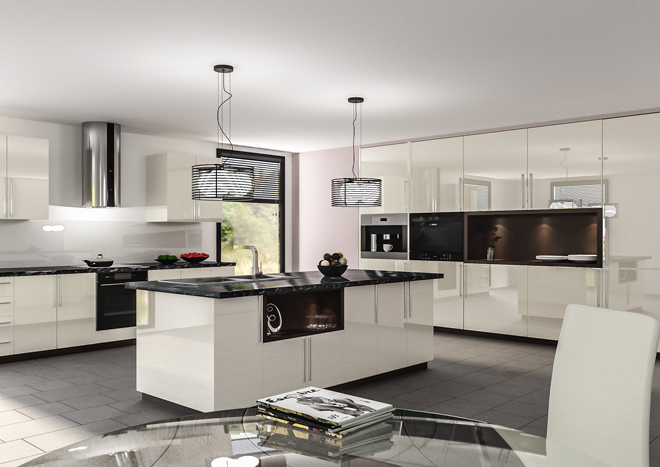 But add a contemporary finish like High Gloss White and you’ll have a bright, airy kitchen that’s full of light. The great thing about a classic door style and a modern finish is that it gives you great flexibility when it comes to choosing things like flooring, worktops, blinds or curtains, and furniture. Keep the look traditional with flagstone flooring and solid wood worktops, or explore more modern options like Corian or quartz worktops. 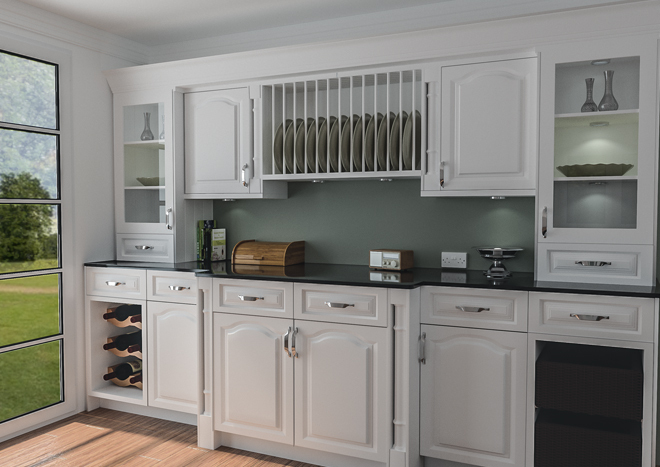 If you’re looking to create a kitchen that will go the distance and won’t date, a classic door design with a cathedral arch is an excellent choice. The Canterbury door in Satin White is a timeless style, and when paired with curved handles that echo the central arch, will imbue your cooking space with understated elegance. Add warmth with wooden flooring, and choose worktops in a durable material like granite. A monochrome palette won’t tie the look of the room to a particular trend, but you can add colour with accessories, soft furnishings and potted plants. Splashes of greenery will stand out against a black and white background – and homegrown herbs will make cooking even easier! Are you the host with the most out of all your family and friends? Does everyone gather at yours for Christmas lunch, New Year’s Eve, and summer parties? Make sure your kitchen is the place to be at parties by turning it into a stylish space for eating, drinking and having a good old natter. 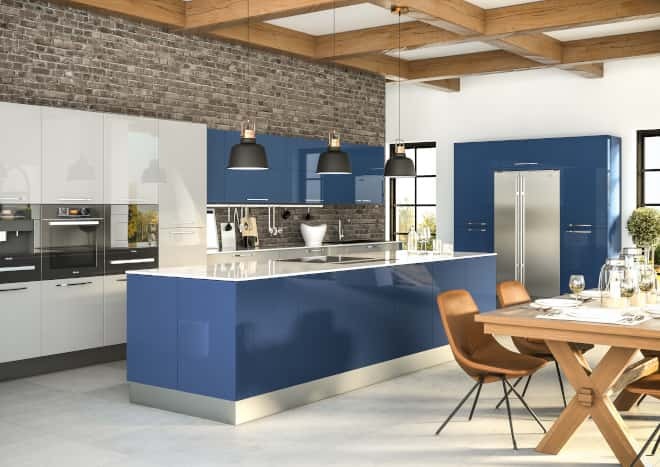 A striking colour and a gloss finish, like the Zurfiz Ultragloss door in Baltic Blue, will do the trick. This bold blue is a real talking point without being overpowering – and you can easily balance its intensity by keeping the rest of your decor pale and interesting. Soft greys, whites and creams will add light to the room, and pale woodgrain furniture will give you a hint of Scandi style.